The crock-pot is one of my favorite appliances. I like that I can leave it on while I’m out of the house, and if I’m an hour late getting home, it’s no big deal. I love using my crock-pot on Sundays! I start the crock-pot Saturday night, then Sunday morning before we head to church I turn it on low. Then if we end up staying later than planned, lunch won’t be overdone and it’s ready as soon as we get home, just set the table and eat. I also like that I can make a large amount of food and invite friends for lunch if I’m feeling hospitable. If not, well then we have leftovers for the week. It’s that simple! This time of year, it is especially handy to have dinner simmering in the crock-pot while you’re out and about or spending the day at the pool or park. Perhaps you think about soup and stew recipes when you think about using your crock-pot, but the crock-pot is actually a great choice for summer meals. They save money, time, and energy. Plus they don’t give off much heat, thus helping to keep your kitchen cool. Click here to read about the four reasons to dust off your crock-pot this summer. 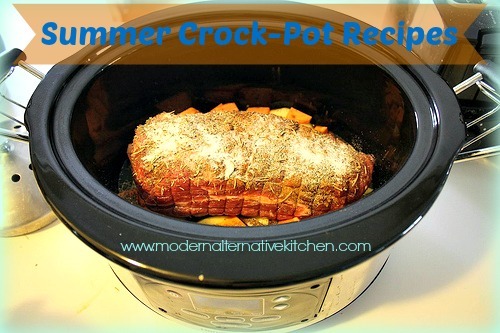 Do You Use Your Crock-Pot In The Summer? What Is Your Favorite Crock-Pot Recipe Or Seasoning?